In our never-ending quest to find ways to curb alert noise, we’ve come up with some amazing features for AlarmsOne. 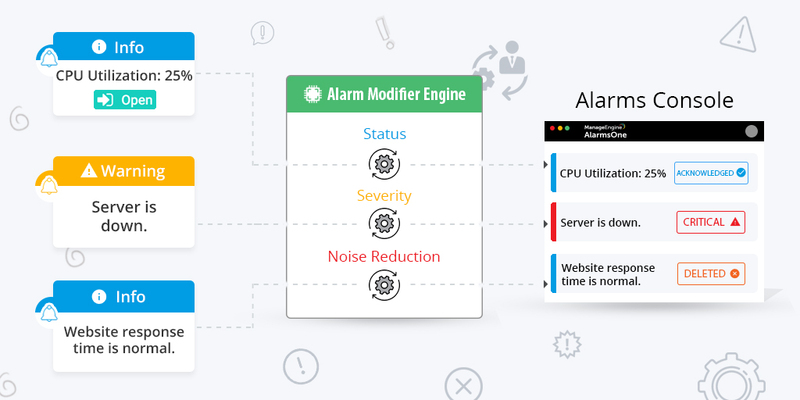 Sure, features like noise reduction and multi-criteria alerting help cut down on noise, but to step up our game a bit more we’ve released a new feature: Alarm Modifier. Now you can automatically acknowledge, close, or delete alerts and have them automatically assigned a severity level when they match certain criteria. You might be used to other monitoring tools lacking accuracy in their alert labels, often with critical and non-critical alerts getting placed in the same category. 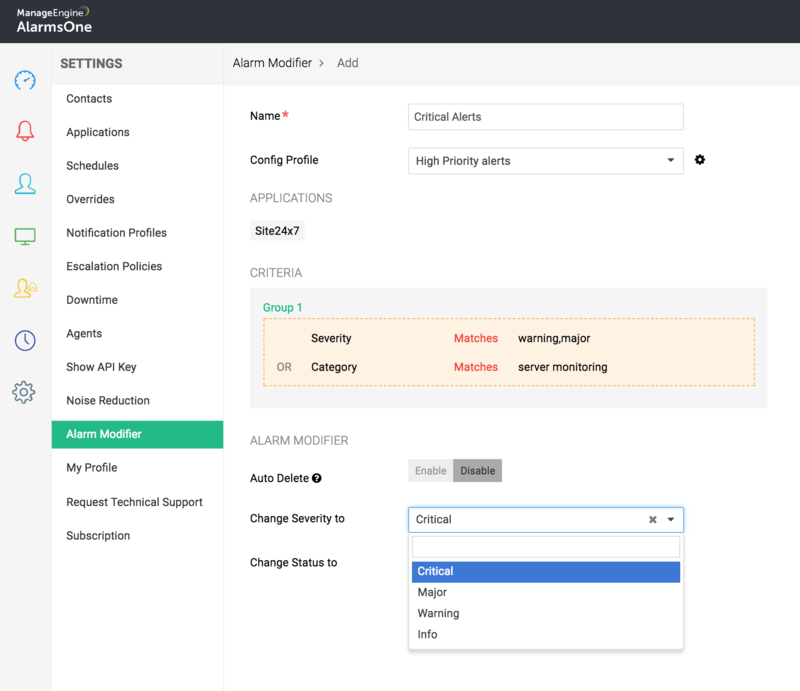 And if you’ve used AlarmsOne’s email integrations in the past, you probably noticed that all the alerts you received from your integrated monitoring tools were assigned the “warning” label. Both of these issues probably left you searching through an alarm’s entire contents just to identify its actual severity, which is easier said than done. Avoid this hassle by using Alarm Modifier to assign incoming alerts with a severity based on their contents, so you can easily spot critical alerts and act on them in a timely manner. Too often, critical alerts from monitoring tools get buried under a plethora of unimportant alerts. 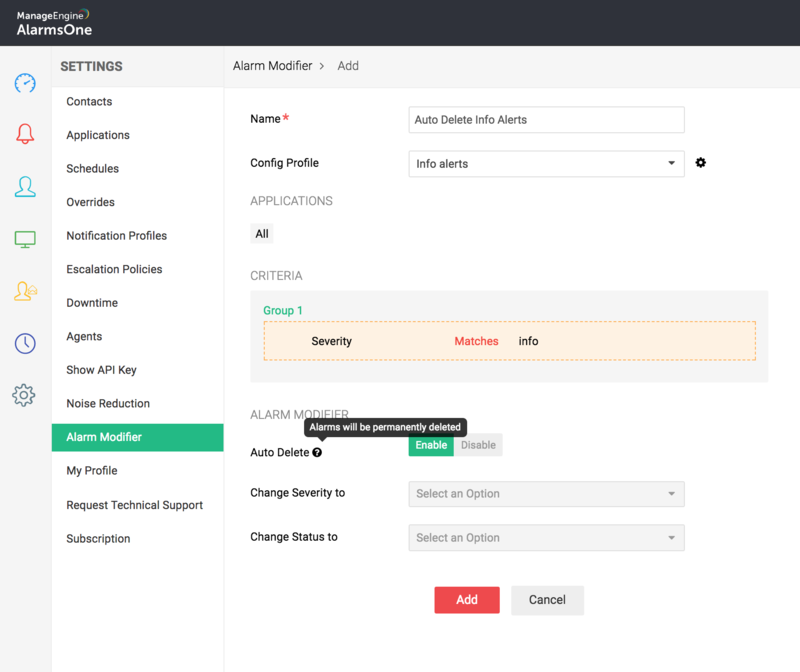 We know that you only want to see critical alerts, and that’s why we’ve included an automatic status change function in Alarm Modifier. You can choose to automatically change the status of incoming alerts in AlarmsOne to acknowledged or closed. You can also delete unimportant alarms so critical and non-critical alerts don’t get mixed together. Configuring Alarm Modifier is simple. Go to Settings >> Alarm Modifier and click Add. Then, define the required criteria. Finally, select which modifications to implement when those conditions are met, and you’re good to go. Tailor alarms to your specific needs using Alarm Modifier. To try out this feature on your AlarmsOne account, click here. If you’re new to AlarmsOne, you can create a new account by clicking here.